Definition of an irresistible invitation? One which dropped into my letterbox recently, announcing the 50th anniversary of the Recaredo family’s Cava Reserva Particular, to be celebrated in their cellars in Sant Sadurní near Barcelona. 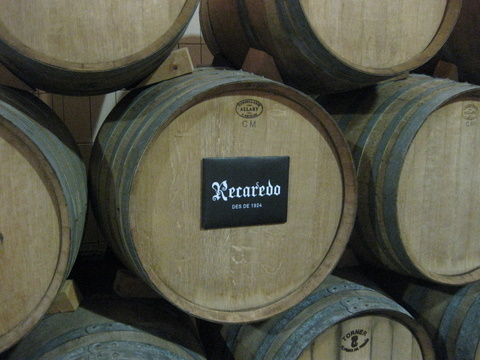 The Recaredo family, in case you’re not yet familiar with the name, produce exceptional cava, Spain’s sparkling wine made by the champagne method. Their mission in life – except that they’re the most un-preachy, self-effacing, modest people you could ever care to meet – is to show the world that fine, vintage cava from low-yielding, classic Catalan vine varieties, made with infinite care and left to slumber for years on its lees, can age with extraordinary grace. We were to taste six different vintages from between 1984 and 2001, all to be disgorged in situ in the company of sommelier Josep Roca of Restaurant Celler de Can Roca (recently designated 2nd best in the world by Restaurant Magazine, after Noma in Copenhagen), with piano accompaniment from Omar Sosa. 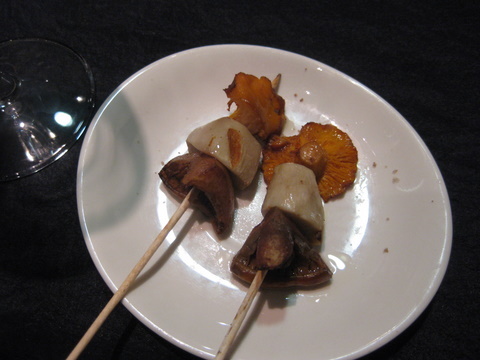 To follow there would be delicacies created by the Celler de Can Roca. It would – you must agree – have been churlish to refuse. A joyful and expectant band of Catalans and Madrileños (and a handful of non-locals) boarded the bus in Barcelona and sped down the autopista to Sant Sadurní into the setting sun. We assembled in the winery courtyard, then plunged downstairs into the cellars, filing past countless venerable bottles in racks, including one gently inclined with a light behind it, to illuminate and illustrate its slumbering lees. Long trestle tables laid out beneath barrel-vaulted ceilings awaited us, set with an impressive array of glasses. 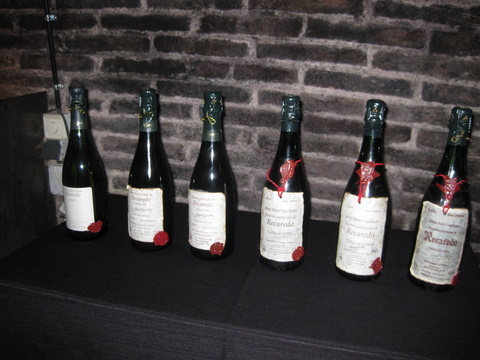 One by one the selected bottles of cava were ushered in and introduced by Ton Mata, grandson of the Recaredo founder, and by sommelier Josep Roca. 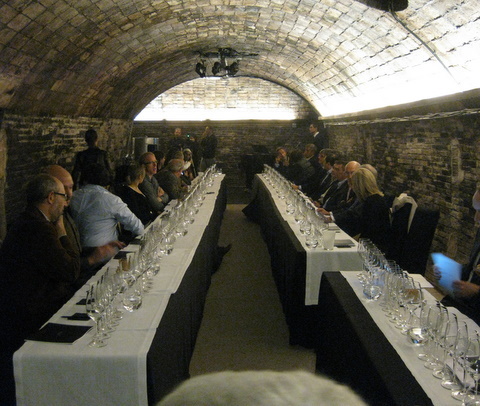 This special event, stressed Ton, was not a ‘technical tasting’, but designed purely for our enjoyment. Such bottles were usually reserved for the family, for special occasions like births, marriages or christenings. “But this evening we want to share them with you, to celebrate 50 years since the first Recaredo Reserva Particular was made, in 1962”. The wire casings embracing the corks were carefully prised off each bottle, corks flew out with a series of resounding pops – and remarkably little spillage – and we got down to business. Or, rather, pleasure. 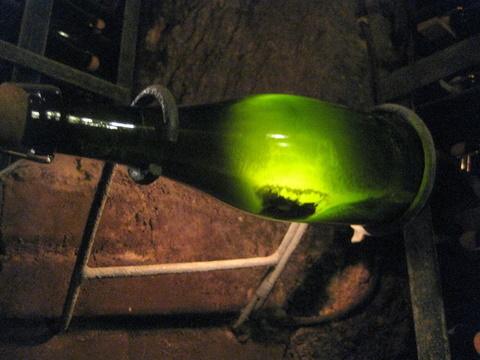 The youngest cava – vintage 2001 – had spent 10 years and 4 months on its lees. Over at the piano, Omar Sosa picked out a gentle, haunting composition to accompany the pale straw-coloured, gently flowery/peachy wine, with fine bubbles and an intense, lingering taste. Next came a 1999, with 12 years and 4 months’ ageing. A deeper gold, it was intensely herbal/floral and full of life, notes which were reflected in the sprightly musical accompaniment. The more classic 1996 (15 years, 4 months’ ageing), with nose-wrinkling intensity and peppery notes alternating with crema catalana brought forth some delicious, sustained, Downton Abbeyish riffs from the piano. Fourth up was a 1993 – “a crisis year, we were suffering post-Olympic stress”, recalled Ton, to rueful chuckles from the [mainly Spanish/Catalan] guests, currently smarting under their own 2012 version of la crisis. “But we have to do our best, good years and bad”. Pale straw with a less obviously showy nose and gradually fading bubbles, its musical accompaniment was a pensive, brooding, minor-key lament. For the 1991, greenish-gold with a toasty, yeasty nose but a rather subdued flavour, Omar stood to lean over the piano and pluck the tune on the strings of the piano à la Keith Jarrett, making it sound like a double bass. Then he regained his seat and the tune dissolved into something very jazzy and harmonious, finishing with a return to plucking mode again. Our final bottle, vintage 1984 with an astonishing 27 years, 4 months on the lees, was living proof that fine cava can age with elegance and good humour, like a benevolent grandpa. Deep honey-gold with a still lively, fresh bouquet, full of complex herbal flavours, it was described by Josep Roca as “materia de memoria, pleno de emociones compartidas” (full of memories and shared emotions), a cava that transcends time. “It’s a pleasure to be able to share this with you”, concluded Ton’s father, Antoní Mata. “This is one of the last bottles made by my father. He died 3 years later. It brings back memories of him, his experience, his regard for all who understood and loved fine cava.” Right on cue, Omar’s reflective, mature, mellow piano notes brought the tasting to a close. Thank you for sharing this delightful and , may I add, life-enhancing moments enjoying life.